Give the gift of a hot air balloon flight! Our flight certificates are very attractive and make a great gift idea for friends, family and co-workers. 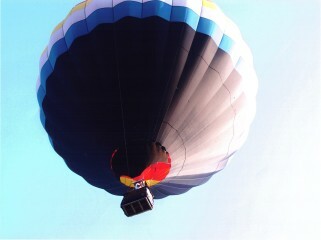 You may purchase hot air balloon ride gift certificates quickly and easily using your Mastercard or Visa credit card. Or pay traditionally with cash or check. Give us a call at (515) 265-2402 and we'll be glad to assist you over the phone. Z-Balloon Adventures taking to the sky with another load of passengers in our ride balloon, a National Ballooning LTD AX-8 made right here in Iowa! If you have a flight date in mind already and would like to schedule a flight directly, please tell us so we may may reserve that date for you. Gift Certificates can be mailed directly to the person you are purchasing the ride for, or we can mail it to you so you can present it to that special someone. You have the option to choose your preferred delivery method or stop by our office and pick it up yourself if you are in a big hurry. Please note: Gift certificates will be mailed the same day we receive your order. Late day orders will be mailed the next business day. We must individually prepare each certificate and confirmation letter, so please allow 45 minutes to an hour so that we may print up your Gift Packet if you are going to pick your packet up. Please call us at (515) 265-2402 or email us at balloon@dwx.com so we can help you make that special someones day!